Was Russiagate the worst press failure since weapons of mass destruction? The end of Robert Mueller’s investigation of Russian interference in the 2016 U.S. presidential election has led to claims from the left and the right that mainstream media got the Russia story wrong. One thing about these grand journalistic judgments about total fraud, scams and death-blows is that the journalists calling for more careful journalism were delivering their conclusions before a single full sentence of the 400-word Mueller report had been published. Fewer than 100 words written by Robert Mueller had seen the light of day. Even though pros like Scott Pelley of CBS’s 60 Minutes said the report exonerated Trump, it explicitly did not. One of the few phrases from the Mueller report that Barr quoted said it “does not exonerate him” on obstruction of justice. In other words, there wasn’t enough evidence of a criminal agreement between the campaign and the Russian government to make a criminal case provable beyond a reasonable doubt. There still could have been many improper contacts between the Trump campaign and the Russians, just not enough to meet the high standard for criminal charges against a president. Trump negotiated for a Trump tower hotel in Moscow well into the presidential campaign after denying it during the campaign. And his personal lawyer lied about it to Congress. The president’s son, son-in-law and campaign manager met with a Russian agent in Trump tower on the promise of getting “dirt” on Hillary Clinton. National Security Adviser Michael Flynn contacted the Russians before the inauguration suggesting steps could be taken to lighten sanctions imposed on the Russians for their election interference. Later Flynn lied to the FBI about it. There is no parallel between the Russia story and the fiction of WMDs in Iraq. The WMDs didn’t exist. The Russian government’s attempt to elect Trump is established fact as are the highly improper Trump connections to Russians. No presidential candidate should be negotiating a huge payday with America’s most dangerous adversary during a campaign. Donald Trump Jr. should have called the FBI when offered dirty on Clinton rather than setting up a meeting in Trump Tower. And Flynn’s overtures to the Russians were improper and the lies about them illegal. It is true that CNN and MSNBC got carried away with nightly deconstruction of the Mueller tea leaves. That established an expectation among Trump critics that Mueller might take down the president whom they loathed. But Greenwald and Taibbi base much of their broad criticism of mainstream media coverage on the unreliability of the Steele dossier. That dossier may well be wrong on many points, including its salacious details. It shouldn’t have been funded by the Clinton campaign. It shouldn’t have been published by BuzzFeed. But the dossier wasn’t the foundation of the mainstream media’s coverage of Trump’s contacts with Russia nor the genesis of the FBI investigation. The foundation of mainstream media coverage was the proven and admitted revelations about the Trump inner circle negotiating for the Trump tower during the election, meeting with a Russian to get dirt on Clinton and promises to ease sanctions imposed for Russia’s election interference on behalf of Trump. Don’t forget what got all of this started: Russians hacked Democratic Party emails to help Trump get elected and apparently passed the hacked emails on to WikiLeaks for broad publication in the mainstream media, which became an accessory to one of Russia’s most successful intelligence operations. Margaret Sullivan, a media critic at the Washington Post, made these points in rejecting Greenwald’s criticism and writing the press should not be bullied into backing off the Russia story. Media tycoon Rupert Murdoch, former editors Roger Ailes and Bill Shine and commentator Sean Hannity became so entwined with the Trump campaign and White House that they broadcast false conspiracy theories, killed damaging investigations and whipped up the anger of loyal listeners impervious to unpleasant facts. 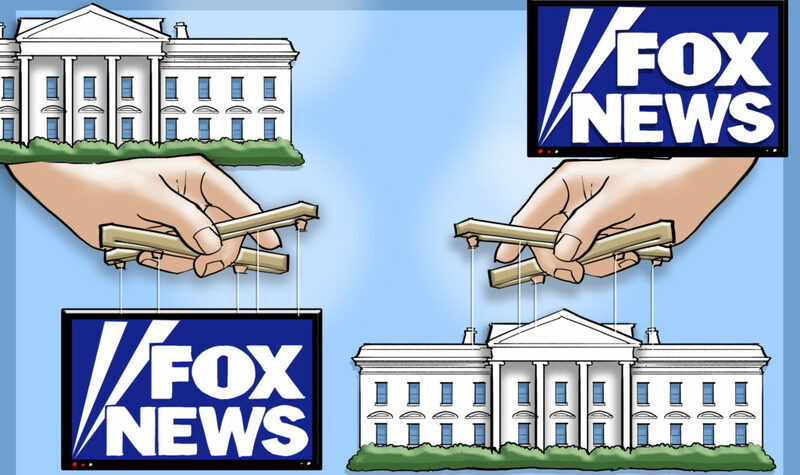 The integration of Fox News into the operation of the Trump White House is so complete that it serves as a kind of Pravda spewing official propaganda gobbled up as truth by a substantial segment of the American people. Trump himself tweets this propaganda directly to his tens of millions of admirers by way of the modern media powerhouse of Twitter in repetitive propaganda slogans – no collusion, hoax, witch hunt, enemy of the people. Fox’s role in the Trump White House and re-election campaign is at odds with the modern understanding of what media are supposed to do. That understanding is built on 228 years of history and modernized by the searing lessons of Watergate and Vietnam – scandals about a president’s involvement in undermining a presidential election and presidential lies in a war that killed 58,000 Americans and millions of Vietnamese. That understanding is this: The press is a watchdog for public corruption. It is the Fourth Estate that checks abuses of power by the three branches of government. And it is the source of accurate news, information and informed opinion for the American people. All three of these functions are as necessary to the engine of democracy as oil is to an automobile motor. The deterioration of the compact about the job of the media is part of a larger deterioration of important understandings about how our government works and the place our democracy occupies in the world. Other post-Watergate, post-Vietnam conventions are at risk – conventions that stood from Ford through Obama. That the president is not above the law. That a president who may have violated the law should answer to a grand jury. That the American people have a right to know what an independent counsel or a special counsel finds when investigating a president. That public officials should be decent and shouldn’t bully private citizens – especially dead war heroes. That men who want to be president don’t write hush money payments to pornstars or negotiate multi-million hotel deals with America’s principal adversary during an election. They turn over their income taxes and divest themselves of financial conflicts of interest instead of padding their pockets. That America is on the side of human rights and democracy, not dictators and murderers such as Vladimir Putin and the Crowned Prince of Saudi Arabia. That America helped build a world order out of the ashes of World War II based on alliances with nations that believe in self-government and international law, not torture and murder. That presidents must never create a false equivalency between Nazis and white supremacists and protesters for civil rights. That there surely is a problem with white nationalism after Christchurch, the CNN bomber, the murders at the synagogue on Squirrel Hill in Pittsburgh, the Charleston, S.C. massacre in a black church, Oklahoma City, the 16th Street Baptist Church. So when Jane Mayer tells in intricate detail the way Fox has become a propaganda arm for the White House, she tells a crucial part of a larger story about how President Trump has turned our nation upside down. Night is day and day is night. Don’t forget there never was evidence tying Richard Nixon to the Watergate burglary at the Democratic National Committee headquarters. Nixon had to resign for his coverup, which was far less extensive than the acts we already know Trump took to derail the Russia investigation – firing the FBI director, threatening and then firing the attorney general, moving to fire Mueller. Mayer reported how Fox killed the story one of its reporters got about Trump paying hush money to Stormy Daniels on the eve of the election to cover up their alleged sexual affair. Sean Hannity pushed the debunked conspiracy theory about how Seth Rich was murdered because he hacked Clinton’s emails – a transparent attempt to distract from the overwhelming evidence that the Russians did the hacking as part of an effort to help Trump get elected. Megyn Kelly’s question about Trump’s nastiness toward women may have been leaked before a debate, Mayer reports. Ailes went to work for the campaign after being forced out of Fox for decades of sexually predatory behavior. Shine took over and then moved to the White House. Fox News has the right to do all of this. The First Amendment protects Fox’s slimy journalism just as it protects all sorts of ugly, divisive and false speech including hate speech of white nationalists and the thousands of lies this most dishonest of presidents has told. But the media and the nation will have a lot of rebuilding to do after Trump is gone to reestablish the conventions that have made the United States the freest democracy in the world. There is no road map for this reconstruction. Journalists should search their souls about whether they are telling the story straight. National leaders should heed Sen. John McCain’s final plea to return to regular order and “Stop listening to the bombastic loudmouths on the radio and television and the Internet.” And importantly, the American people have a responsibility to escape their media bubbles and unplug from electronic tribal warfare that fills the air every evening on cable as Rachel Maddow and Chris Hayes battle Hannity.